The famous Tempura Endo also has a restaurant in Beverly Hills in the US. 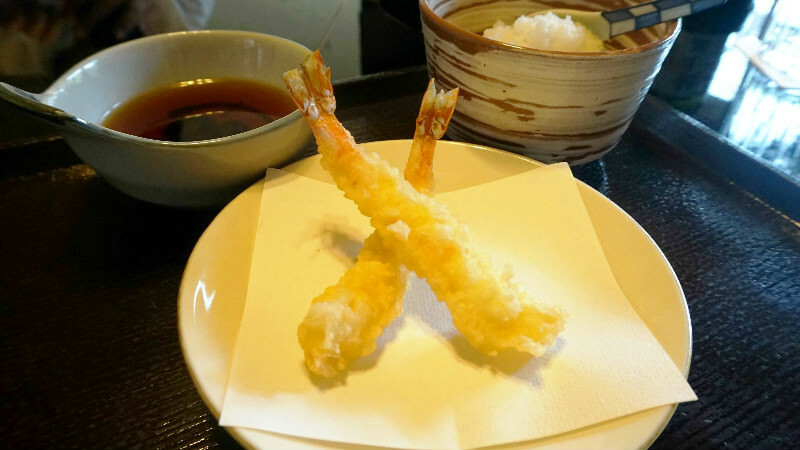 In the restaurant, which is in a Japanese traditional house built 100 years ago in the sukiya- style, you can enjoy tempura made using seasonal ingredients. Their tempura is simple, but it makes the tastes of the great ingredients shine. They use such luxurious ingredients as kuruma prawn, uni (sea urchin) wrapped in nori, their renowned corn, sesame tofu, and mushrooms and truffles when making their tempura. You can choose where you sit: at the bar counter, or in a private room, but wherever you sit, you can enjoy the special feeling inside the restaurant. This restaurant with its dishes, atmosphere, and service all of the highest quality, is sure to make your trip to Kyoto even more special. For lunch, they have two tempura courses, 4,000 and 5,500 yen each, and also a tempura and kaiseki course for 8,000 yen. For dinner they have a tempura course for 10,000 yen and two tempura and kaiseki courses, 13,000 and 15,000 yen each. In the picture you can see one of the most famous tempura dishes of this restaurant, uni wrapped in nori. Besides this you can also see corn tempura and an endo bean croquette. The specially made salt and tentsuyu, tempura dip, make the exquisite taste of Tempura Endo’s tempura stand out even more. If you dip your tempura in both the salt and the dip, the delicate taste of the tempura will not stand it, so only choose one. The matcha in the matcha salt is made by Kyoto’s famous Tsujiri. The restaurant, of course, has a nice selection of beers and wine that go well with tempura, but I’d like you to try some sake from Kyoto. Among the sakes from Kyoto, Jurakudai’s Junmai Daiginjo is something that goes together with the tempura absolutely beautifully. You have many seating options: the tempura-bar, tempura-bar ozashiki, ozashiki (private tatami room), tea ceremony room, private room for banquets, table seats, and the carpet room to choose from. The room in the picture is the Japanese-style tempura-bar ozashiki with a sunken fireplace. The normal way of eating tempura in Japan is to put a spoonful of grated daikon to the tempura dip. So, take a spoonful, put it into the dip, and stir the dip a bit and you’re ready to start dipping! When making a reservation you can tell the restaurant if you have any ingredients you don’t like. This way they can avoid serving those to you. They can also serve vegetarians by serving vegetable tempura only. The seasonal tempura I had in the restaurant was delectable, and I got to see the Japanese garden while I ate. Among all the things we had, I liked the uni wrapped in nori tempura the best! It was first time having I had sea urchin prepared this way. The restaurant also offers a nice selection of wines and sake to go with the tempura, and after having some exquisite drinks, I felt like I was in heaven! If you want to have tempura in Kyoto, my recommendation would be this restaurant. The restaurant is 100 meters to the east from Kennin-ji Temple’s south gate and 150 meters to the west from Yasaka Pagoda. Open every day, including New Year’s holidays, Golden Week, and the Obon week in August. ・Please don’t come to the restaurant in overly casual clothes, for example shorts and sandals. ・The restaurant doesn’t allow children. ・Service charge for counter seats is 10% and for private rooms 15%. This restaurant is popular world-wide, so they can serve you in both English and Chinese.